A seasoned executive with extensive experience in the Material Handling Industry, Ciaran brings superb skills and business acumen to our accounting team and organization. Bluff Manufacturing welcomes a new face as the company brings on Ciaran Farrell, a sophisticated financial strategist, as its new Chief Financial Officer (CFO). 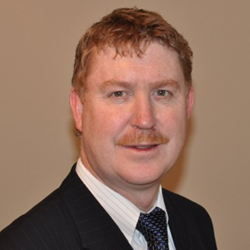 “A seasoned executive with extensive experience in the Material Handling Industry, Ciaran brings superb skills and business acumen to our accounting team and organization. He has vast experience at growing companies where he was instrumental in providing strategy and leadership to help them get to the next level. We are fortunate to have found Ciaran to help us meet our growth goals going forward”, said Andrea Curreri, President of Bluff Manufacturing. For more than 45years, Bluff Manufacturing has been recognized as an innovative leader in the fabrication and design of high quality dock, warehouse, and industrial safety equipment. Bluff Manufacturing, whose customers include Frito Lay, Lumber Liquidators and Airgas, designs and tests to comply with the American National Standards Institute’s (ANSI) MH30.2 standard, ensuring the highest quality products and providing customers with the greatest possible value. Based in Fort Worth, Texas, Bluff Manufacturing serves the entire U.S., South and Central America, and the Caribbean and Middle East through a national distributor network, and the company’s -7 distribution warehouses ensure quick delivery of the standard items in the company’s product line including yard ramps, dock boards, dock levelers, wheel risers, and safety barrier product TuffGuard. Bluff Manufacturing acquired B&L Structures in June 2010, expanding its portfolio to include platforms, cantilever rack, stairs and ladders, conveyor support structures and conveyor crossovers, and mezzanines. These products are sold through Bluff’s national network of distributors.